With the Pop Lip Colour + Primer, which launched last year, Clinique brought us a lipstick that was just about as perfect as could be. Great, intense colour, an easy to apply formula, a comfortable feel and a juicy, non-greasy finish. I had thought before testing them out that the Primer part would be a gimmick – just a word that they had thrown in to make the whole enterprise sound more marketable and unique – but to my great surprise the primer worked. It managed to smooth over minor flakiness and the colour didn’t bleed or wear off quickly. I think, at the time, I called Pop Lip Colour + Primer the perfect lipstick for learners. Foolproof. 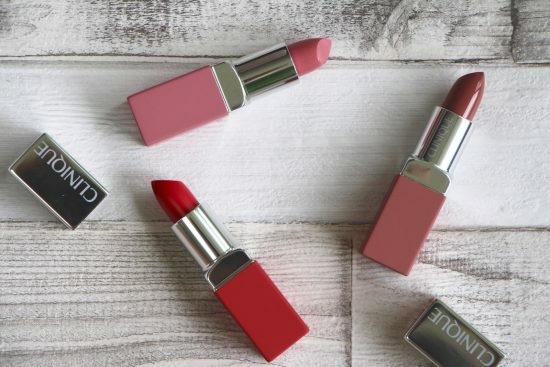 And now Clinique have introduced a new little gem – the Pop Matte Lip Colour + Primer, which is probably one of the most wearable matte lipsticks you’ll find. If you’ve always wanted to go for that edgy, sultry, retro sort of look but have worried about getting dry lips or accentuating fine lines or flakiness then this is the starter stick for you. In fact, you’ll probably never move on from it if you try it – there’s no real need. It ticks all of the matte boxes (non-drying, vivid colour, a chalky-ish-yet-comfy finish) and, at £16, it most definitely does not break the bank. The post Shu Uemura Fall 2014 Vision of Beauty appeared first on British Beauty Blogger. Sunday Tittle Tattle: Dogs, Luxury Prizes and A God in Ruins. Comments Off on Sunday Tittle Tattle: Dogs, Luxury Prizes and A God in Ruins. 2) I mentioned this briefly last week, but just a reminder: Colab (my dry shampoo brand) is running a brilliant competition with Superdrug. One winner and a friend will be sent to Monaco on a luxury trip – Michelin star food, helicopter ride, plush hotel, the lot. To enter, just go on over to the Colab Instagram page. It’s for UK peeps only, this time. 3) I’m starting on a new book, A God in Ruins by Kate Atkinson. It’s the sequel to Life After Life, which I loved. I’m going to do a book post really soon as I’ve read some excellent novels recently, so I’ll try and finish this one quickly and add it in. If you’d like to “read along with me” (silently, if you don’t mind) then you can find A God in Ruins here. It has only just come out – I had it on pre-order and it just turned up in the post one morning last week. Lovely surprise… If you’d like to read Life After Life before you get cracking on this one, then that is here online. It’s absolutely brilliant – it’s one story told over and over and over again, but each time something tiny happens differently and the whole story changes. I couldn’t put it down. The post Sunday Tittle Tattle: Dogs, Luxury Prizes and A God in Ruins. appeared first on A Model Recommends. Someone has very kindly pointed out to me that Whistles currently have 20% off everything, including the gorgeous Lola dress that I wore on a recent trip to France. I mentioned that I wanted to buy it in khaki, so I was quick as a fox when I heard about the discount. Unfortunately, I have to wait for a call-back because the khaki one is an “order from store” item, but they have it to buy online in black (here), orange (here) and navy (here). All are reduced to £76 instead of £95.